The Dolomites, a UNESCO World Heritage site, were born out of the sea and offer a unique breathtaking landscape. 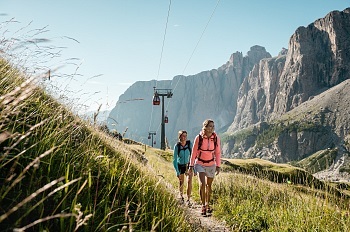 Explore Alta Badia's natural treasures on foot, discover the great geological mysteries behind these mountains and their historical sites. Enjoy a walk you will not forget. The Dolomites, a UNESCO World Heritage Site, are different from any other mountain. They are nicknamed "Pale Mountains" for the uniqueness of the white rocks (made of double calcium carbonate) they are made of. The Dolomites in Alta Badia offer spectacular landscapes and unforgettable colors. Explore the panoramic terraces and the parks Puez-Odle and Fanes-Senes-Braies, real treasures to live on the move. Along this panoramic path which leads through rocks, screes and green meadows, you can admire some of the most beautiful mountains in the world, the Dolomites – UNESCO World Heritage site. The mountain range between Sella and Puez offer interesting landscapes that show the geological evolution of the Dolomites over millions of years.